The whole Internet Drama over Isle of the Unknown (the source of the gorgeous picture to the right) reminded me of something Geoffrey McKinney did in that book that I've given serious thought to at times. Namely, instead of giving the magic-users a repertoire of spells from the list in Lamentations of the Flame Princess, he chose to give each one a unique and non-repeatable power, frequently tied to some piece of equipment or to animal companions (part of a Zodiac theme that is shot through that work). Another LotFP product, The Seclusium of Orphone of the Three Visions (which I feel that I should like in principle but find myself tepid on in execution) assumes that proper wizards aren't limited to spell lists and straight-up have powers and "often they are other things entirely, and have other origins, natures, and lifecycles." I've considered using a similar for NPC wizards, giving them powers that don't neatly slot into the standard D&D spell system. Partly I think this is really juicy and mythic; it isn't like Circe or Merlin runs around casting Fireball or Detect Magic. They have powers, properly, and those aren't constrained by the limits of a spell list. I find the idea that NPC wizards and witches might have straight-up powers that aren't on the spell list to be an easy way to inject a bit of mythic wonder into a game. A second reason I've considered it is the relative power of certain spells. It's long been noted in old school circles that an enemy magic-user can TPK a low level party pretty trivially by casting a single Sleep spell. There are ways to "go easy" on a party once Sleep is cast, but a lot of them are sort of lame. Giving the enemy wizards some totally unrelated powers seems to be an easier way to resolve this. There are further benefits to this approach. One is cross-compatibility. Probably the biggest fiddly issue with modules and supplements is when a magic-user's spell list is enumerated and it contains a spell that's not in the specific game you're using. This is an annoying problem with clones. A unique powers cuts this out, since the power is listed directly. The other is simplifying high-level magic-user encounters for the referee. Instead of juggling a dozen or more spell options, the referee just has to pick from, say, one to three powers. Of course there is a downside. Specifically, it's something of a tease to give enemy wizards a power that PC magic-users can basically never get. That's not to say that PCs normally get other magic powers, like a dragon's breath or a basilisk's gaze, but using the same spell list for PCs and NPCs does give PCs the aspiration of being able to turn the tables on foes. This can be remedied by making a way to get these powers, but making it very difficult to do so. If you run a game where finding spellbooks is difficult, not having NPC casters use spells is an obvious issue. And it does cross a certain "feel" boundary, since NPC magic-users casting spells is a pretty ingrained part of the game from its earliest days. Still, I think it's an idea worth doing some experimentation with. An NPC wizard able, say, to shape and control certain plants might be a really interesting wilderness encounter, or a witch whose hexes go outside the "normal" boundaries of the spell system. I'm going to give this one a bit more thought on ways to go forward, but I like the basic concept. This is a simple note to people who write OSR adventures. DON'T USE BOXED TEXT OR READ-ALOUD TEXT IN MODULES. I listened to a long review on the Save or Die Podcast (a podcast I enjoy very much) talking about an intriguing module/mini-setting called Whisper & Venom. 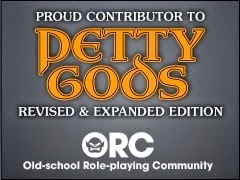 The SoD crew waxed poetic about the art, the maps, the production values, the boxed set, the hardcover, the adventure and NPCs and locations; but they said two words that killed it for me: boxed text. I don't care if it's a TSR module or OSR module; I don't care who wrote it, or what ideas it has. I will not run a module that contains programmed text meant to be read aloud by the referee. I'm no longer going to buy or support modules that I know contain read-aloud text from OSR publishers. It's a holdover from tournament modules, which aren't fit for campaign use, and should not be used as a model for designing adventures today. Read-aloud text should never have been a part of an exploration game. The whole concept of D&D is that player characters are discovering what is in a previously unknown environment through their characters' actions. Either read-aloud text is made of clues about the room, in which case it has to be listened to carefully and parsed line-by-line by players, or it doesn't and it is just a waste of time. If I'm running a module, I need a concise description of the room that I can convey to the players as their characters explore it. All clues should be in the room description, not some in the boxed text and others buried in the other description paragraph. This is a foot-down issue for me. It's 2014! Stop making modules with boxed text. I did Edgar Johnson's OSR Survey, having seen it linked on G+, and it had one question that really intrigued me: If you had to run a game tomorrow, what books would you use for prep? This is the list I came up with. These are really for the treasure charts. I might substitute another core rulebook but I'd probably have Monsters & Treasure handy anyway. I usually use this for gems and jewelry - really only for referencing the values and deciding what the types are. I also reference the dungeon dressing stuff from time to time. This is for Startling Statues, Precious Pearls, the charts for determining ruin types, and the chart for determining what you find if you search. If I had to run an adventure tomorrow, I'd steal one of Dyson's maps. More charts. The charts in this are fun. I'd probably roll up a monster to be weird. This is for stealing "normal" monsters. Both of these books are pretty freakin' massive. I might grab another monster book but you can't go wrong with those two. * Yes, I know the RPGPundit made his notorious review of Isle of the Unknown recently. Screw that. I like Geoffrey's weird monsters. So, dear readers, what books would you use for these purposes? 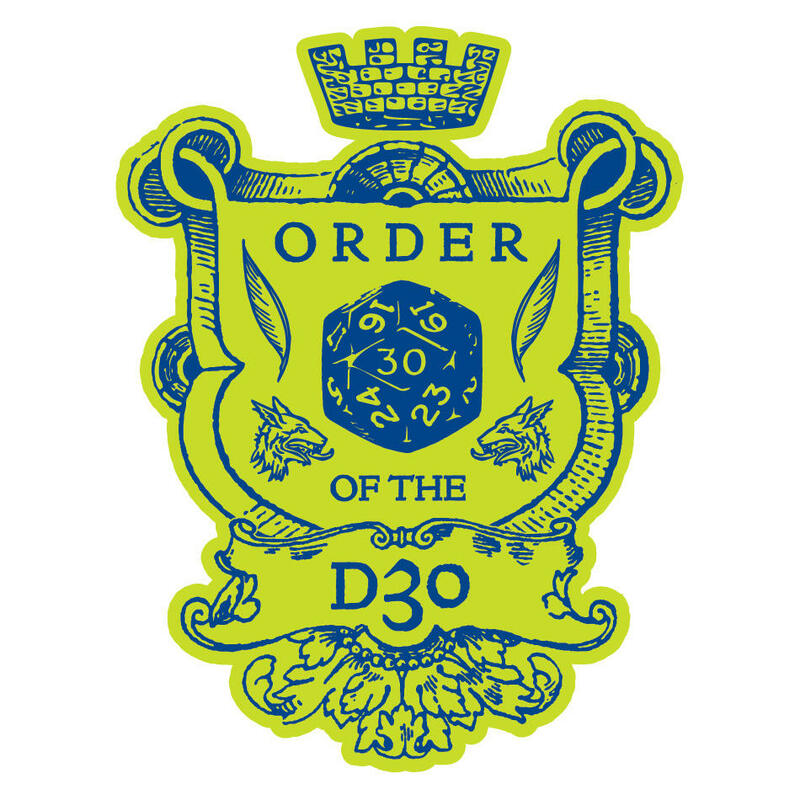 So in my science fantasy world and associated megadungeon, I want to swap out the monster listing for OD&D. 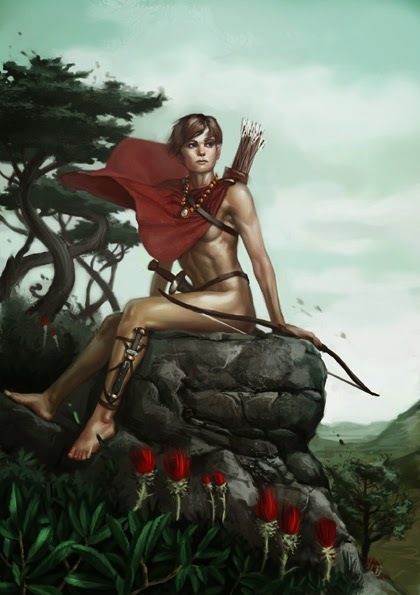 A few things will be classically Dungeons & Dragons, but even those will be somewhat modified. I think the general size of the monster list in Monsters & Treasure is good, and want to talk through it. After Men, who deserve their own entry, we get the cursus honorum of humanoids: goblins, kobolds, orcs, hobgoblins, gnolls, ogres. I've always seen these as the bread and butter enemies at lower levels, making up megadungeon factions and holding various roles in the dungeons. I mentioned in a previous post that Selenites would be replacing goblins, so it's worth taking a bit of a look at them. In The First Men on the Moon, Selenites are pretty easy to kill, being moon creatures; starting them off at 1-1 HD and assuming they're a little more solid will approximate that. One note is that I also want larger, more dominant Selenites to replace gobgoblins on down the line; this is in line with the hierarchical Selenite culture that Wells laid out in the novel. I particularly like this because it lets me vary hit dice and armor class within the same monster. The main occupation of Selenites is herding mooncalves, which are absolutely massive creatures. I like that; having big mooncalf caverns gives a very definite ecology to the question of the dungeon. Mooncalves graze on underground fungi, Selenites eat fungi and mooncalves. One of the big advantages is that Selenites are fundamentally underground creatures. Their civilization is in the underworld, and the ones in my dungeon will have taken control of some part of a complex in the early levels. 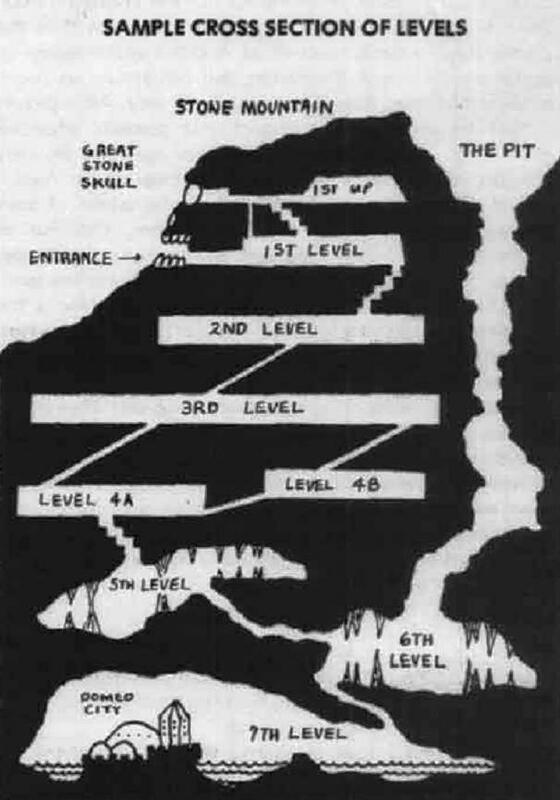 I'd sort of like to play it where only people who've been down in the underworld have any idea that they even exist; it's not like they're the lizardmen, who the PCs would know about, but rather a totally alien creature as soon as they go down. As subterranean entities, I think Selenites should still get the goblin's -1 to hit in bright light. OD&D also carries a note that goblins "attack dwarves on sight." This one suggests a possibility, that dwarves who came to this planet with the setting's humans have possibly had some run-ins with Selenites in the past and there is now a standing order to attack any dwarves they may run into. This would also be an interesting twist if dwarves spoke the Selenite language where they currently speak Goblin. So that's how I'll be replacing goblins. Next, kobolds. So as I am starting to flesh out a new world, the logical question came up: what, exactly, are the influences and works that have inspired this take? There are literary influences, but most of them are safely "Appendix N" - Burroughs, Vance, Lovecraft, Dunsany, Merritt, Brackett, Norton - and if I listed some others a lot would be token. There's a bit of H.G. Wells (The Time Traveler, The First Men in the Moon) and some ostensible nonfiction like Chariots of the Gods? - but its not that interesting. But that's all words. What really inspires me in terms of setting are look and feel. Perhaps because I've never been very good at art, I've always loved visual sources. When something strikes my eye, it makes a much deeper impression than a story. As to why there's a city underground, well, it's because of this drawing. It's a Holmes thing I guess - sticking that city under the dungeon is something I've wanted to do for a long time, an explorable high-level ruined metropolis. Recently I saw Mike Mignola's concept art for Disney's Atlantis. This is what I want my ruined city to look like. I know the Disney city is supposed to be underwater, but think of it in a massive cavern instead. Those long staircases are simply epic. The towers have this ancient astronaut vibe to me, which I've covered before and want to use for some of the "looks" of ancient weapons and such. Mignola's characters also fit my vision of the blue-skinned underground humans, who I see having various tribal-esque tattoos. It's just such a different thing to see in a D&D game that I love it. Another favorite of mine is Jean Giraud/Moebius's concept art for Alejandro Jodorowsky's Dune. Dune is maybe my favorite novel, and the mad vision of Jodorowsky may not be very close to the original, but people made absolutely stunning visual art for it. Moebius's characters have a visual flair that makes me want to create a world where they fit. There will definitely be suits of armor that resemble the Sardaukar here, and I really want to have people in my world who look like this. Another big visual influence is feathered dinosaurs. Like a lot of kids, I was obsessed with dinosaurs when I was a kid. The modern vision is radically different. I love dromeosaurids, partly because "Velociraptors" were popularized by Jurassic Park, partly because the real things are also interesting. Besides, how much fun would it be to have turkey-sized raptors where most dungeons have kobolds? Scaled dinosaurs, of course, have a part to play as well; but the variety of colors and shapes is endless, and prevents things from getting repetitious. 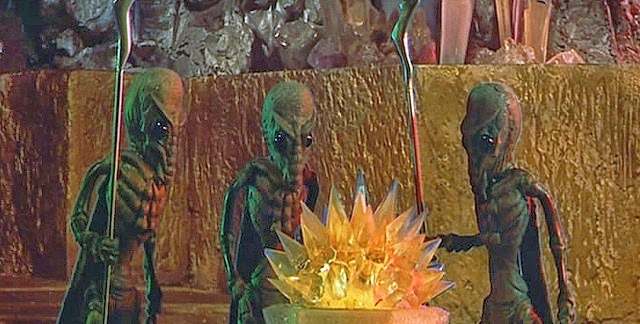 Selenites (right) from an early French film of The First Men in the Moon are one of my favorite weird races, and conveniently they live underground, tending monstrous "mooncalves." Moreover, they are "specialized" based on their particular function in society. 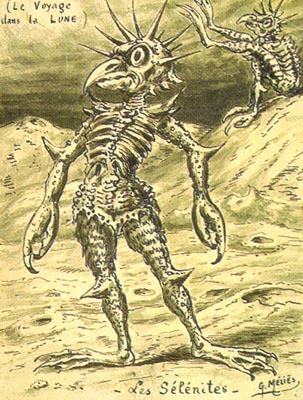 What a perfect alien race for science fantasy D&D! The French art makes them look perfectly bizarre while retaining a "humanoid" feel. I think with some variety, they could take up a good chunk of the role played by the goblin / hobgoblin / bugbear part of the cursus honorum of humanoids. One of the things I really want to accomplish is a world that looks different from standard D&D. I really like the vision of how radically out of place the PCs will look in medieval gear, and the possibility that as the game goes on, they'll have more of a mixed aesthetic. So that's the look, which is a lot of the inspiration.